If there’s an emergency, your kitty’s “meows” may not be enough to tell the rescuers to save them. 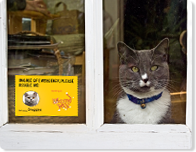 That’s why we want to give you the opportunity to create a sticker that will let everyone know there’s an animal in your home - it’s fun, easy and your cats will be grateful! If you want to add a personalized touch, you can upload photos of up to 3 of your furry feline friends and add them to the sticker. It says it's for cats, but you can put up a picture of any of your pets and their names. One reader told us that, "I thought just because I "liked" something it meant I was automatically signed up for something". No, sorry, you need to sign up for the freebies by clicking on the links, each freebie separately. Not just sign up for Frugal Freebies on Facebook and that's it.